Adding the Thunbergia on the Limited Original of Intriguing Arches reminded me of this beautiful climber. I had forgotten all about it until our client asked for a vine with purply-blue flowers. We have one in the garden and I see it all the time, DUH! 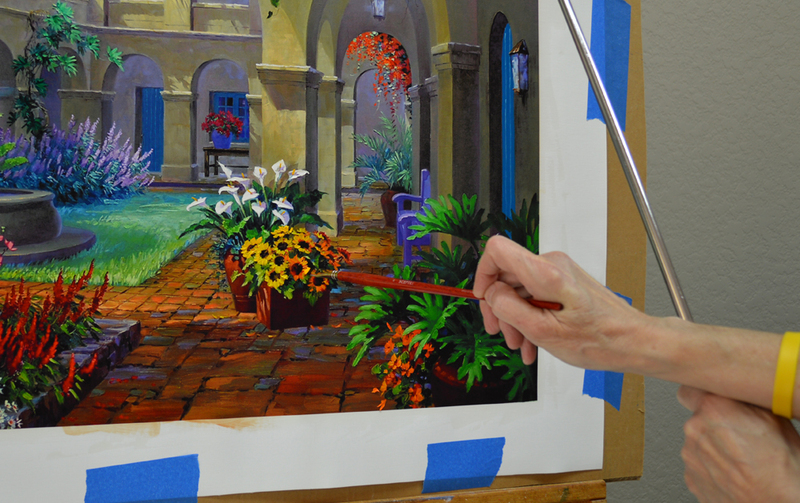 Bracing against the mahl stick makes delineating the deep centers of the blooms much easier. The light and shadow pattern of the irregular paver floor is blocked in. Then I loosely indicate the curving perspective lines between the old terra-cotta tiles with a fine liner brush. 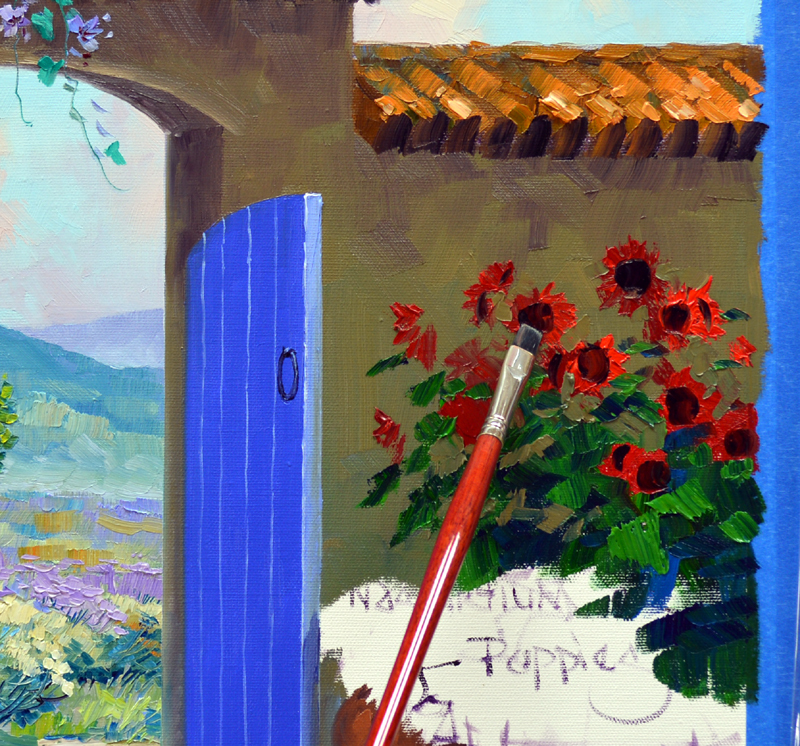 Now it’s time to paint the Amazing Red Sunflowers. We couldn’t believe it when we saw the seed packet, Amazing Red is actually the name of this crimson variety. 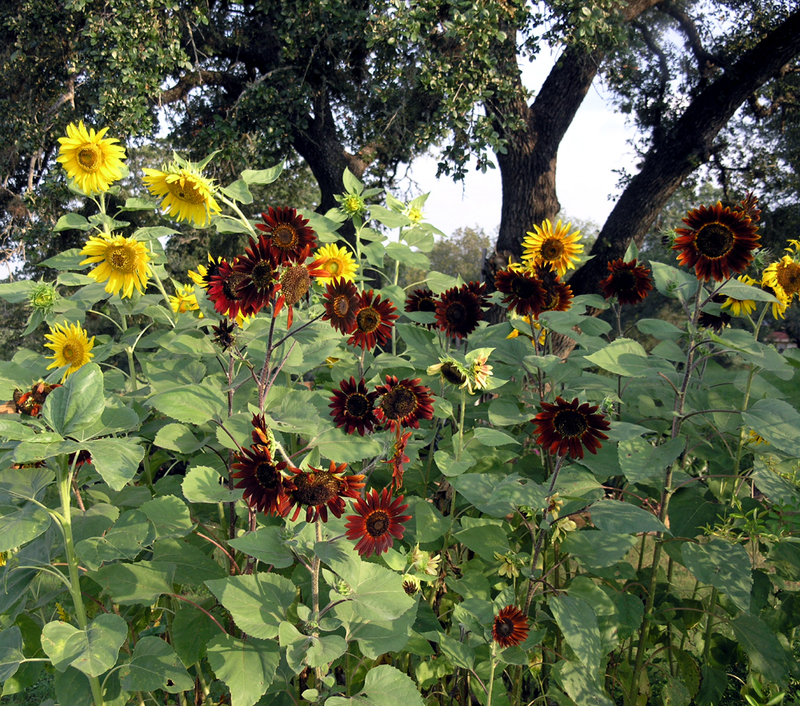 They made a great combination with our regular yellow, Mammoth Grey Stripe Sunflowers. That variety has large striped seeds. 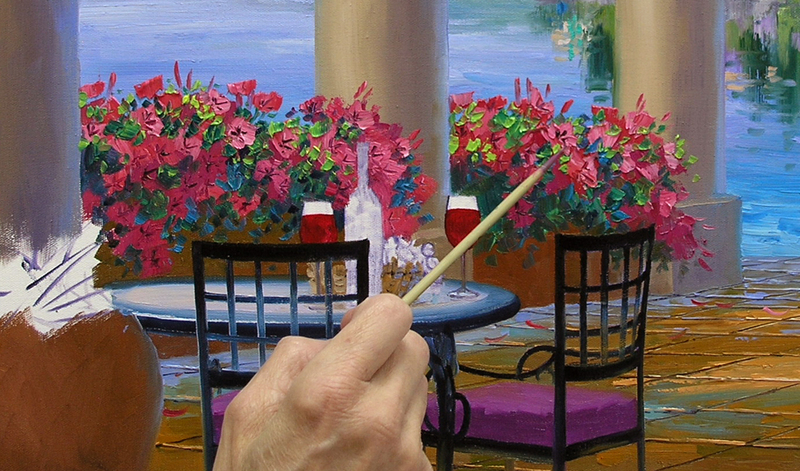 The red blossoms are painted first with mixes of Cadmium Red Deep + Magenta and pure Cadmium Red Deep. Some Cadmium Red Light is added for the highlights. 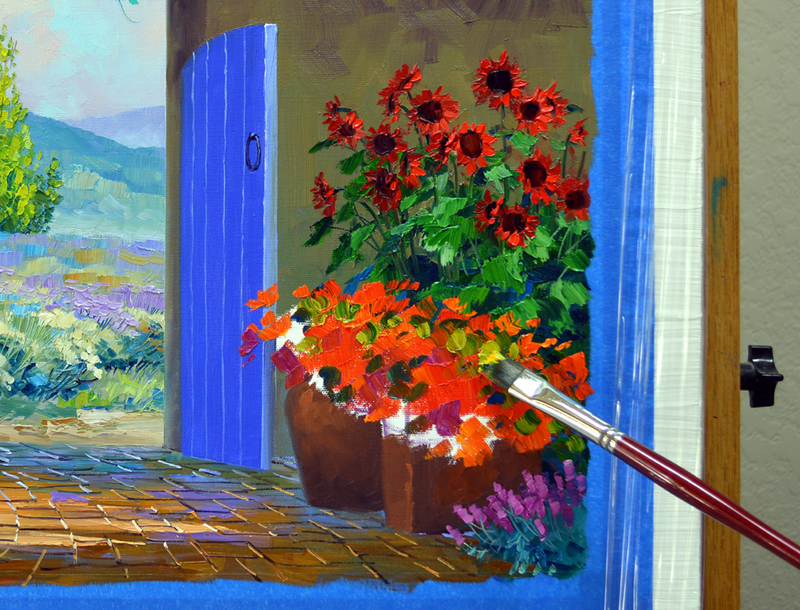 Foliage made of Pthalo Blue + Hansa Lemon Yellow is painted around the blossom color. Then the large, dark centers of the Sunflowers are added. Sunlight dances across the tops of the Nasturtiums nestled in pots at the base of the Sunflowers. 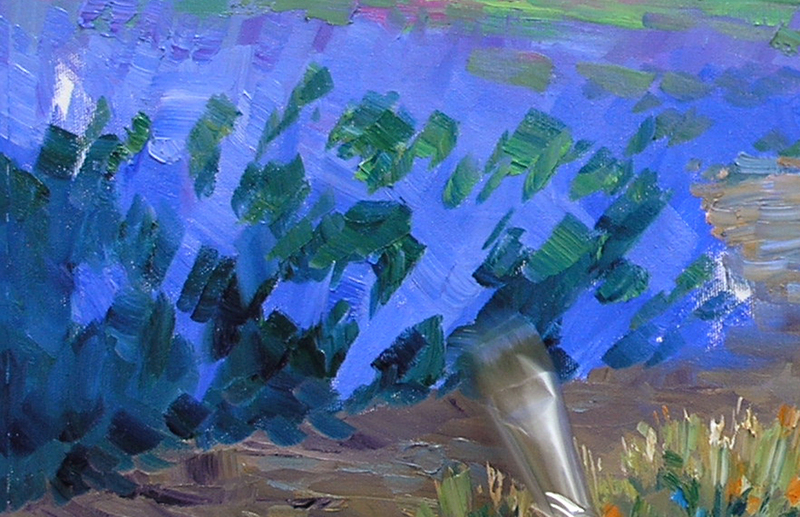 The warm green leaves are made of Ultramarine Blue + Cadmium Yellow Deep. Magenta Petunias and White Daisies fill the planter in the lower left corner. Lavender and blue make up the shadows of the white flowers. Remember the Jim Croce song, I’ve got a Name? I’m probably dating myself with that reference but I loved that song as a teen and still do. Well, we have the smartest and most helpful readers, our pretty butterfly definitely has a name. As Charity Dakin, a wonderful artist from Canada said, “How absolutely fitting. Your mystery butterfly is a …………… PAINTED LADY Butterfly!” Would you like to meet Charity and see some of her art? You can, just CLICK HERE. It’s back to Santa Fe for a nice fall day. 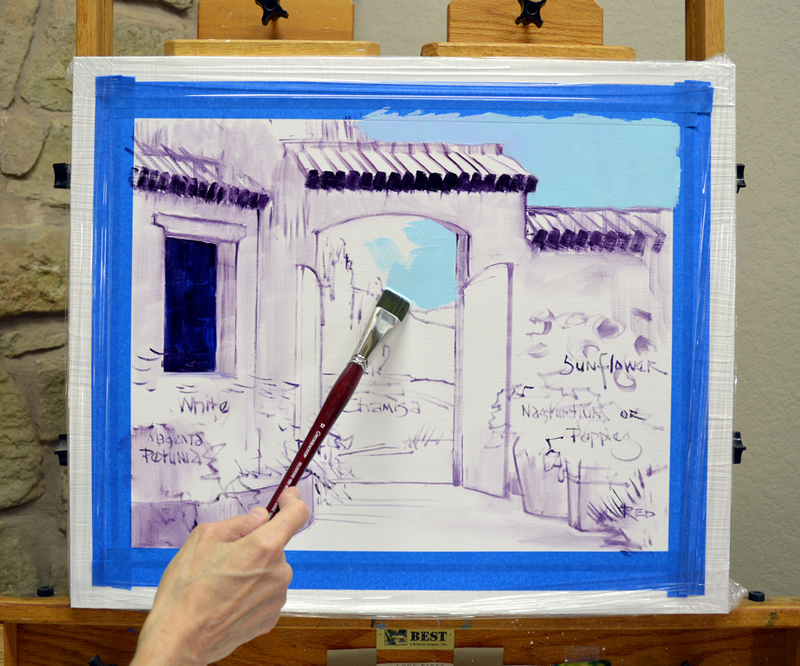 The basic elements are sketched up on the canvas with a thin oil wash made of MUD (Ultramarine Blue + Alizarin Crimson) + a liberal amount of Liquin. Then I begin painting with the sky. In the early fall the hills around Santa Fe are covered with soft yellow Chamisa. I love the way the leaves of the Poplar Trees flutter in the breeze, catching the light as they wave to and fro. The dark walls of the courtyard act like a tunnel, directing the viewer’s eye to the sunlit scene beyond. The roof tiles are painted with various mixes of MUD + Cadmium Orange and MUD + Cadmium Orange + Cadmium Red Light. A few strokes of green from the distant hills are randomly added in the roof, giving the feeling of moss growing on the tiles. 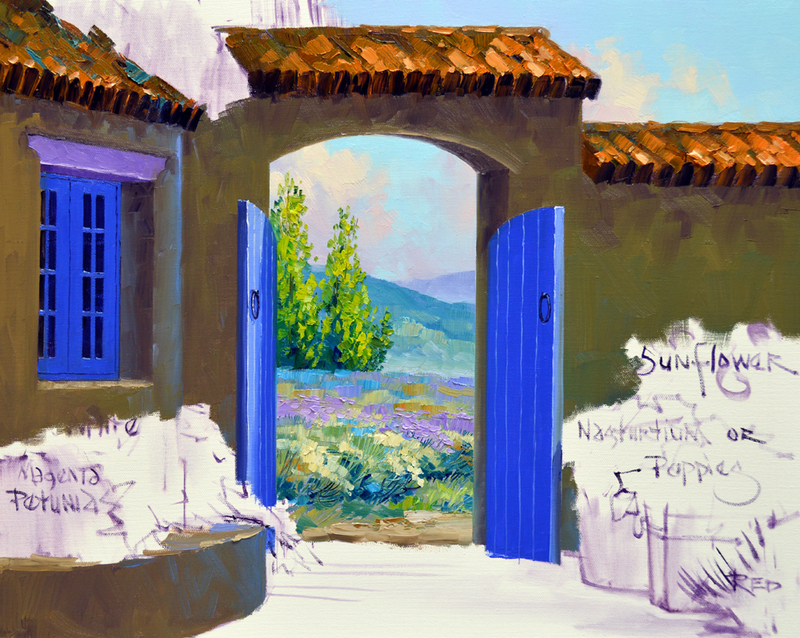 Mixes of Ultramarine Blue + a little White are used for the window and gates. Senkarik Pond looked so bright and fresh this morning. We got 2 inches of rain yesterday. Quite a surprise since we only had a 30 percent chance! But we just happened to be in the right place. 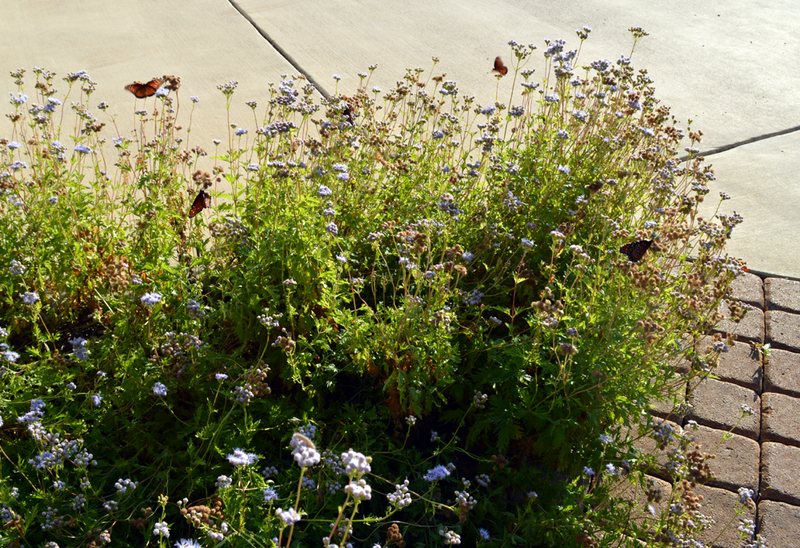 The sun brought the butterflies out. When Jack and I walked by the bed of Blue Mist on our way to get the morning paper a cloud of butterflies rose, floating in the air around us. I ran back in the house to grab the camera, this was too good of an opportunity to pass up. 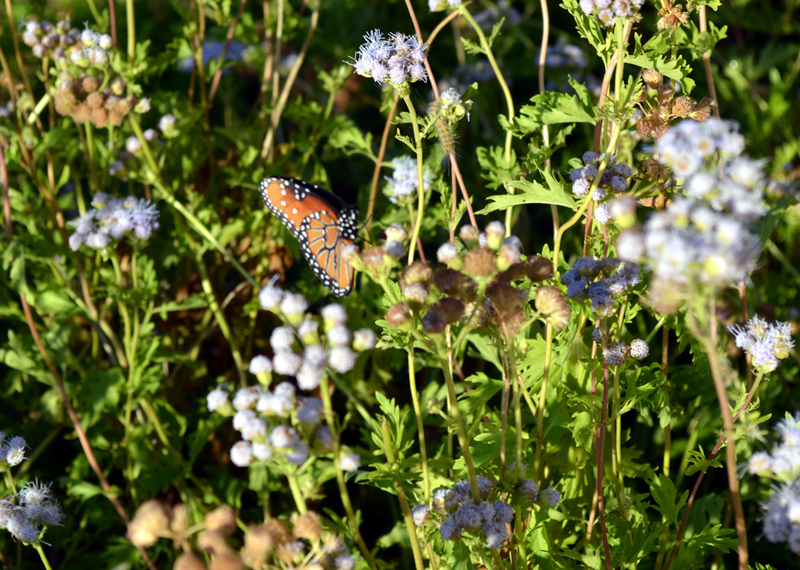 The Monarchs are passing through on their annual migration and they stop to gather nectar from our flowers. Just click on the picture if you would like to see it larger. Sunlight cascades across the tops of the purple Pride of Maderia in the background and the Calla Lilies come alive when the pure White highlights are painted. 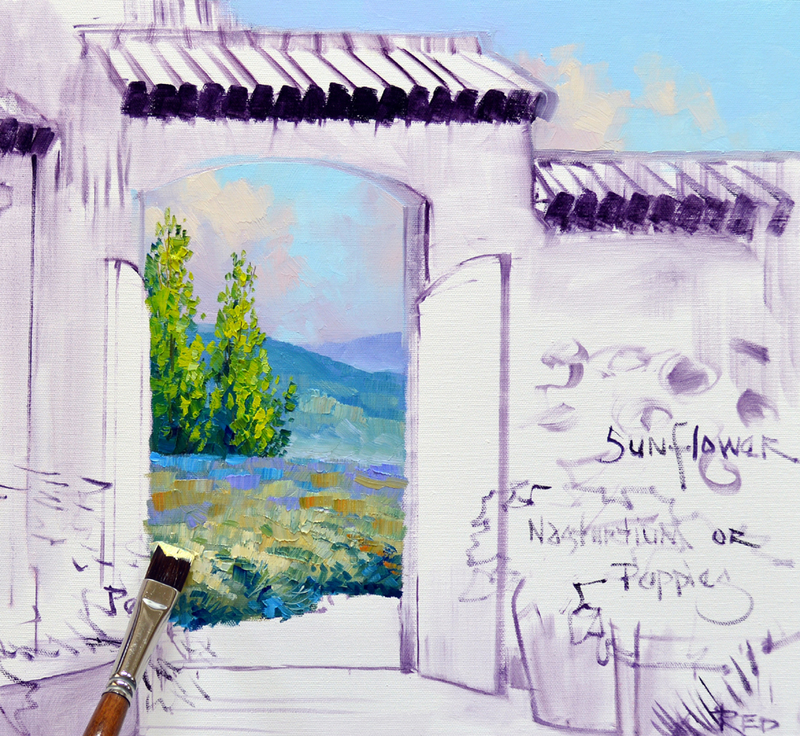 Then the Sunflowers are accentuated with various combinations of Cadmium Yellow Medium + Hansa Lemon Yellow and Cadmium Yellow Medium + Cadmium Orange. 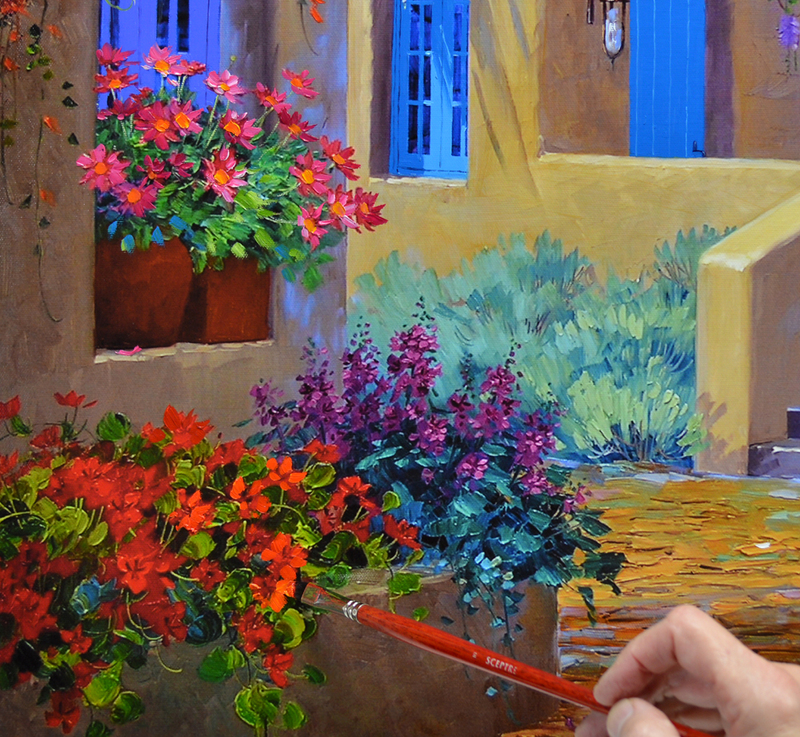 The Alkyd Oil Paint is applied thickly giving the blossoms lots of texture. 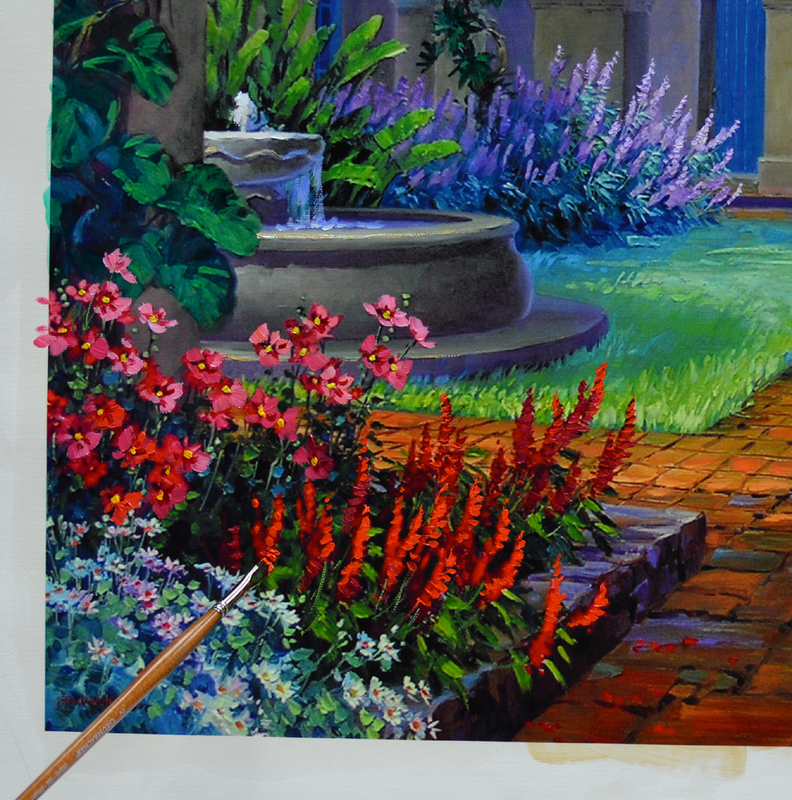 After highlighting the bubbling water in the courtyard fountain I repaint all of the flowers in the lower left corner. To enlarge any of these pictures just click on the image. 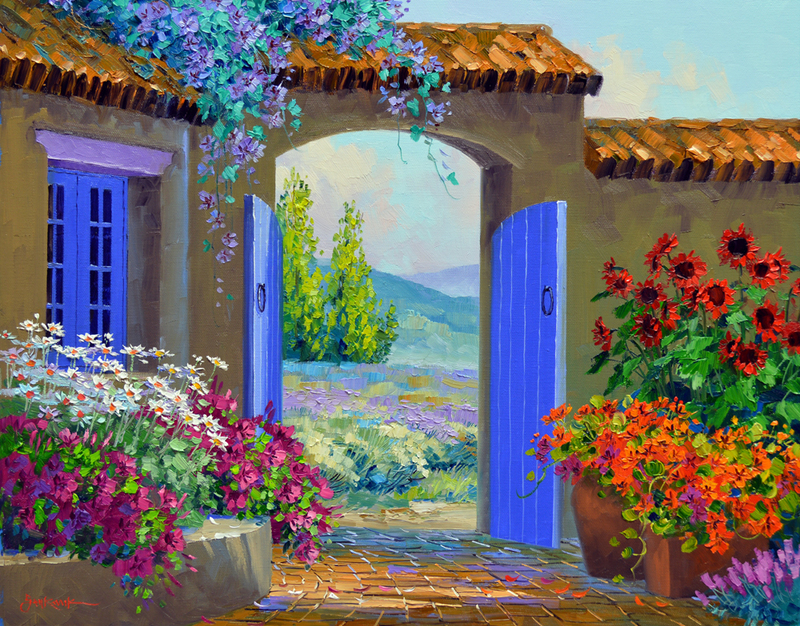 Our collector asked me to add some blue blossoms in the vine over the archway. So let’s make it into a Thunbergia Vine with rich blueish purple flowers. 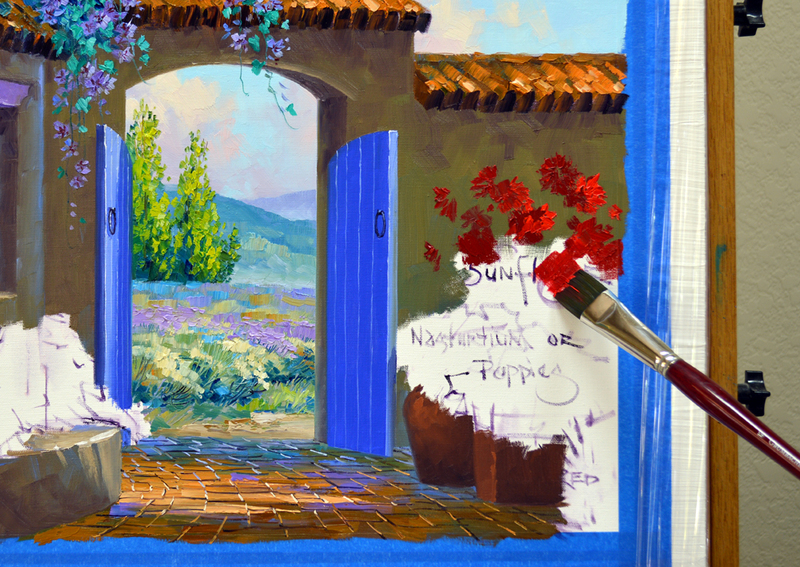 Ultramarine Blue + a touch of Dioxazine Purple + White is used to make the petal color. You can also see the labeling of the Limited Original along the top edge. Several of my readers have asked how I label our Limited Originals with the edition number and copyright. We keep the editions small, between 45 and 49. Here is what I do when the piece is going to be stretched on stretcher bars and framed traditionally. The top edge of the border is taped off with 1 inch painter’s tape. This will be where the canvas is pulled over the top of the stretcher bar. Then I write the Title, Edition Number, Copyright information and Personalization along that edge with a Sharpie Pen. When the canvas is stretched the information will be right side up! Staples can be inserted below the labeling. The tape is pulled off leaving a straight line of labeling. The giclee has been coated with two thin layers of UV varnish. The varnish is completely dry and we can begin the embellishing process. A thin glaze of Raw Sienna + Liquin is used to enhance the color of the architecture. 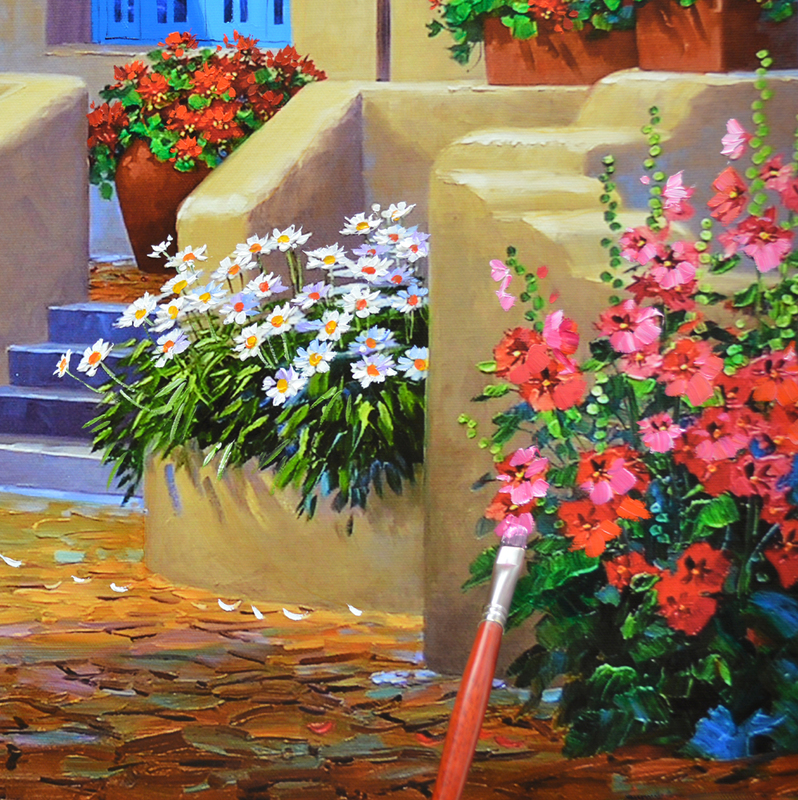 Cadmium Red Light highlights brighten up the Geraniums in the pots on top of the wall. 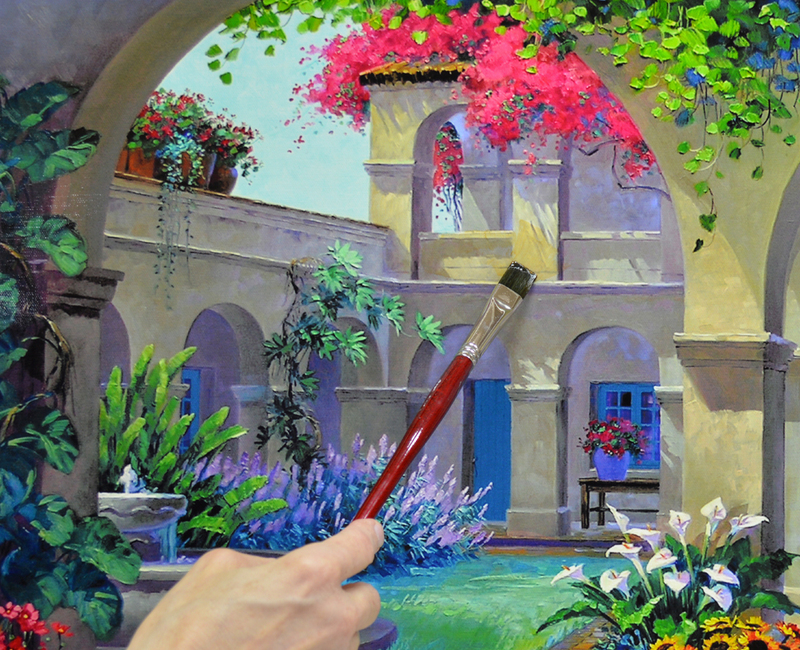 Then the Bougainvillea is totally repainted with mixes of Permanent Rose + White and Permanent Rose + Magenta + White. Today I’m working on a commission of two of our hand embellished Limited Originals on canvas. They will hang on either side of an arched doorway in our client’s home. The unembellished giclee print is taped to a piece of double ply cardboard. The first step was to apply two thin coats of UV Varnish with a foam brush. The varnish has dried and we are ready to begin painting. Alkyd Oil Paint is laid out on my palette just like my regular oil paints. 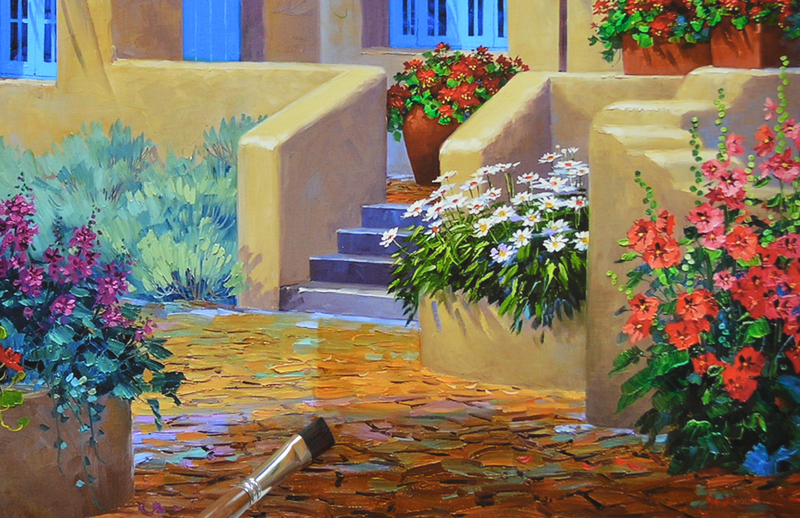 I use Alkyds to enhance our giclees because they dry much faster, usually in a couple of days. The adobe buildings are glazed with a thin wash of Raw Sienna + a liberal amount of Liquin. This makes the color of the walls richer. You can see the unglazed portion of the wall to the right of my brush. The cobblestone walkway is also glazed using a mix of Burnt Sienna + Liquin. Notice how much deeper the color is above my brush to the right. The windows and door are repainted. A mix of Pthalo Blue + White is used for the shadow areas, more White is added to the mix for the portion of the windows in the sunlight. 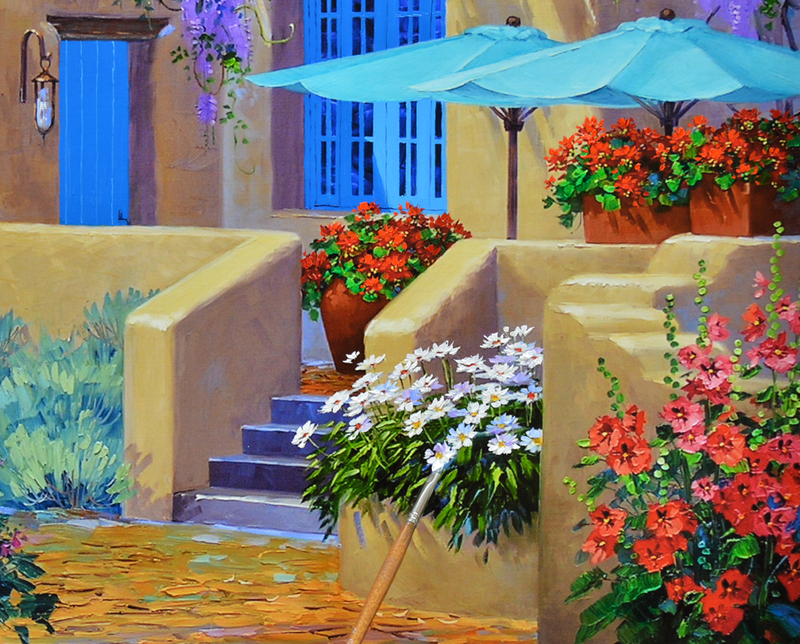 The Geraniums have been repainted. Now I’m working on the Daisies adding pure White to highlight the petals catching the sun. 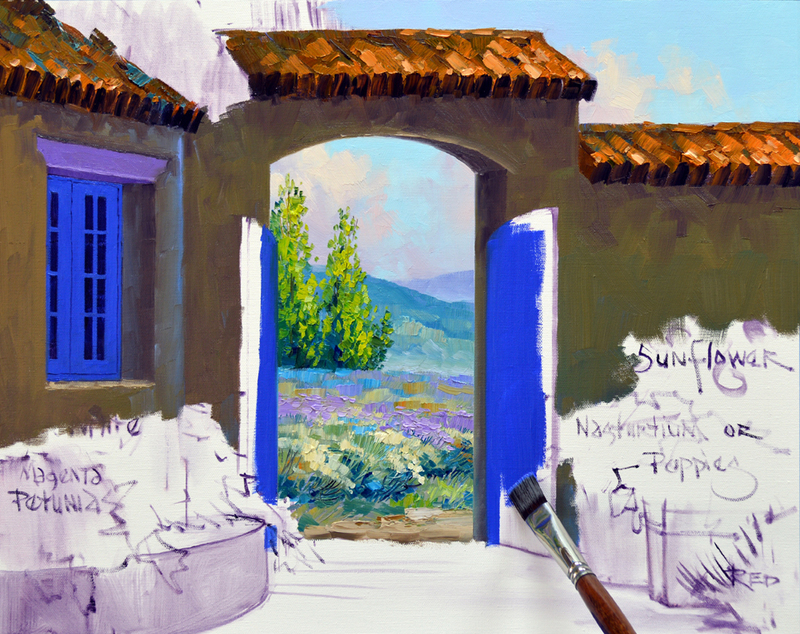 The window in the foreground is painted with a mixture of Ultramarine Blue + Dioxazine Purple + White. 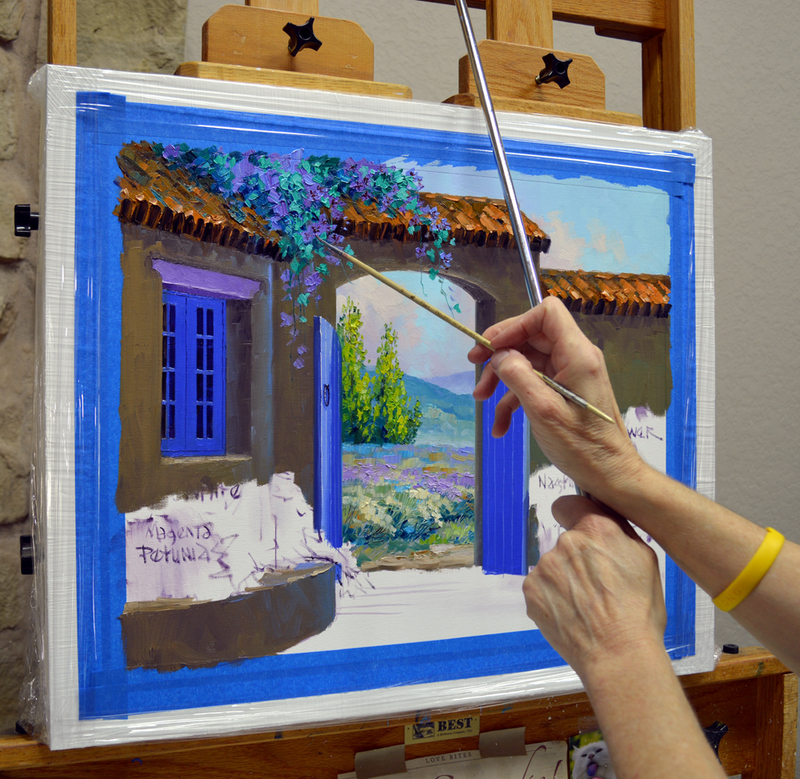 My wrist is braced against a mahl stick to steady my hand while painting the detail. What is a mahl stick? CLICK HERE to find out. The Cosmos in the window are embellished with Permanent Rose + White and Permanent Rose + Magenta + White. Various mixes of Magenta + White are used for the upright flowers of the Delphinium. Rusty oranges made of Alizarin Crimson + Cadmium Red Light and Cadmium Red Light + Cadmium Orange make the blossoms of the Nasturtium cascading over the wall in the foreground. Cadmium Red Light is added to some of the pink leftover from the Cosmos. This makes a coral color perfect for the Hollyhocks. More White is added for the blossoms extending up into the light. Our collector wanted to have less rocks and more flowers in the right foreground. We decided Magenta would be a good mix with the other wildflowers. 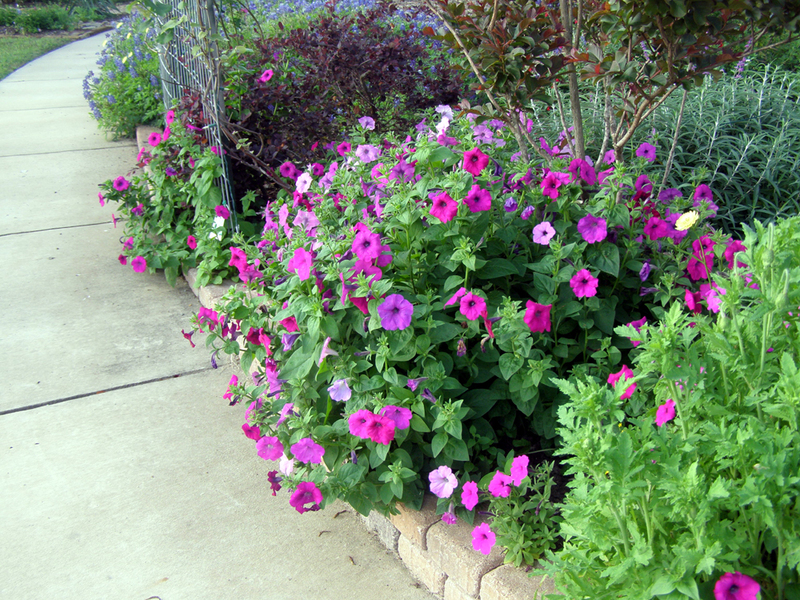 So what better than Laura Bush Petunias? 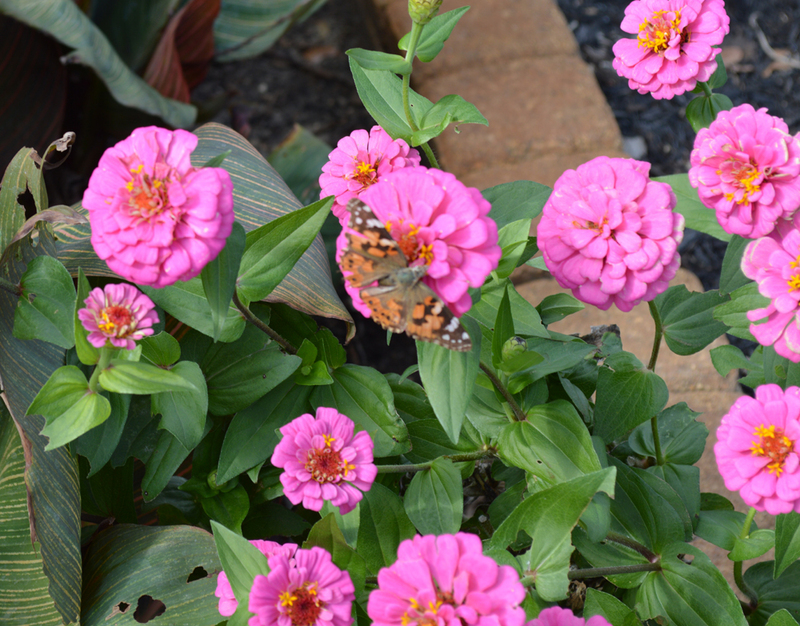 They are such a happy flower and love our Texas heat! The ones above are from our garden last spring. Bluebonnets are peeking their heads out as you follow the sidewalk around the bend. Click on the image if you would like to see the picture enlarged. 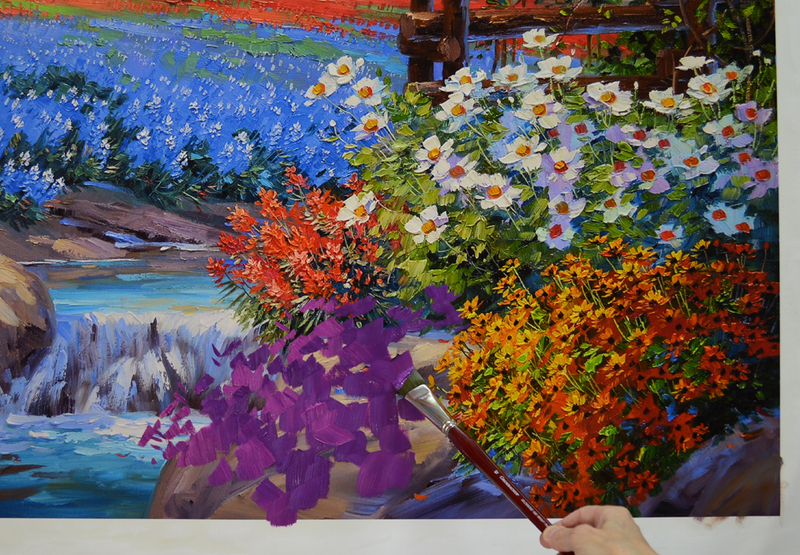 The flowers I’m adding are painted in the same sequence on the giclee as on the original oil painting: Flowers First, Leaves Last. 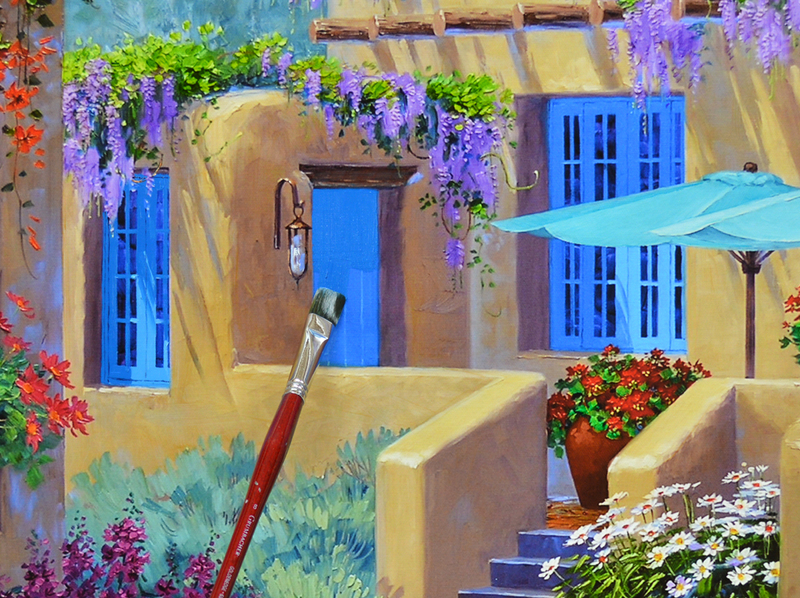 I use mixes of Magenta + White and Magenta + a touch of Dioxazine Purple + White. Now for the foliage of the Petunias. Various proportions of Pthalo Blue + Hansa Lemon Yellow are used. The greens are worked around the Magenta, shaping the fragrant blossoms. A small outcropping of rock is left showing underneath the Petunias at the edge of the water, this helps to ground the grouping of flowers. Without a glimpse of the rock the mass of flowers would appear to be floating. 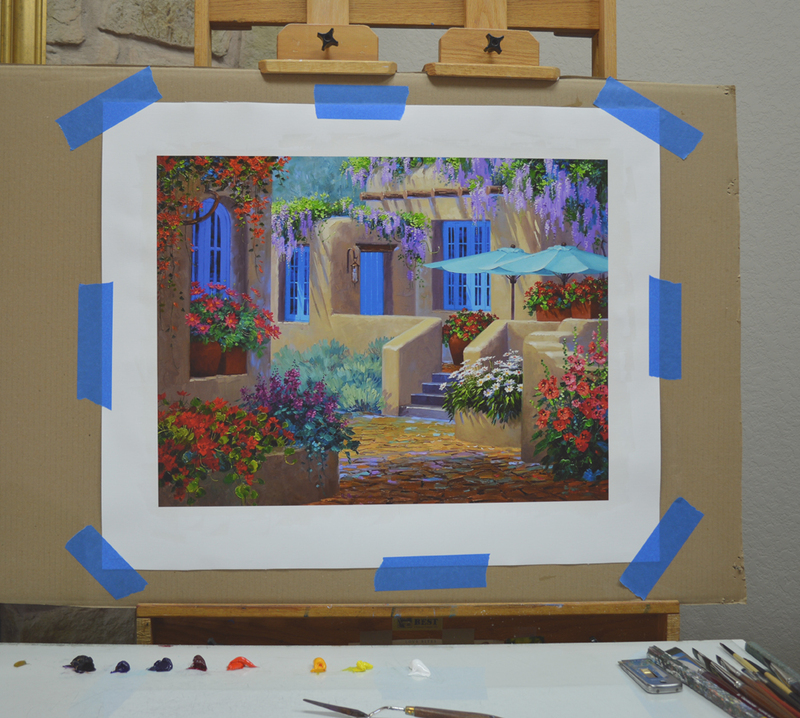 While the paint is still pliable I sign the Limited Original Giclee exactly like I do on my Original Oil Paintings. The edition number is written on the white border of the canvas with a Sharpie pen about 1 1/2″ from the top edge of the image. This way it will show on the back when the piece is stretched. 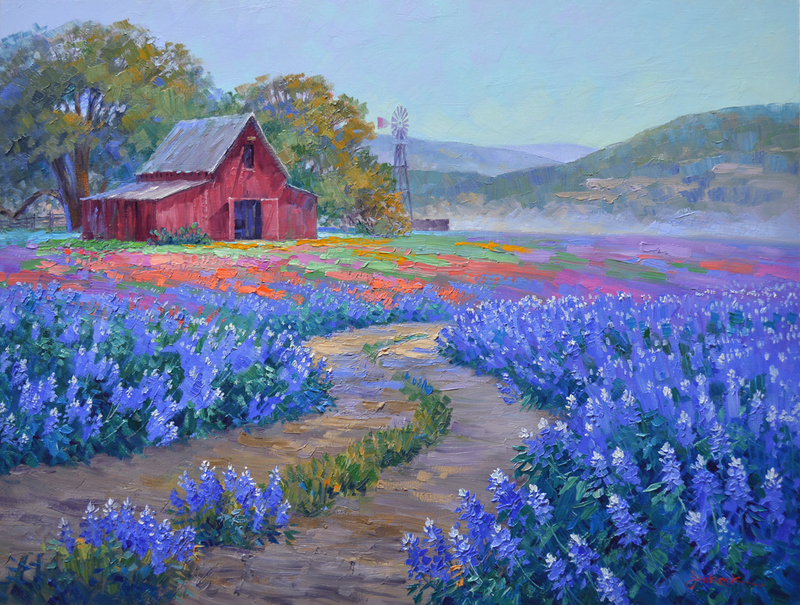 The field of bluebonnets is enhanced with Cobalt Blue. The white tiptops are also highlighted. The ones in the foreground are made of White with a tiny touch of Cobalt Blue. 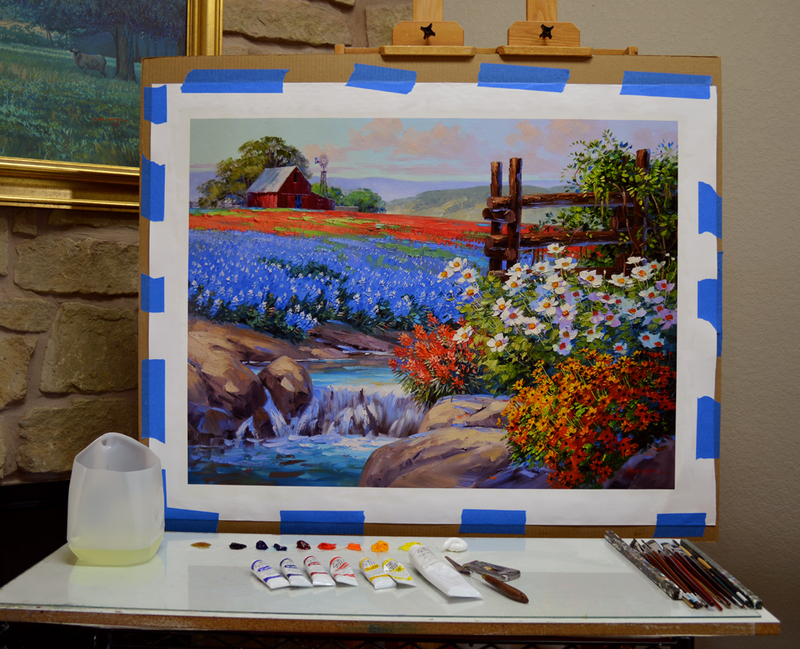 A little more blue is added to the white tops as the Bluebonnets recede. Pure White is reserved for the highlights on the Matilija Poppies as the sun dances across the crepe-paper like flowers. The whites in the giclee print are just a little blue so when the Pure White is painted on it really zings! Deep Yellow Coreopsis glow next to the Laura Bush Petunias. I enhance the cheery flowers with Cadmium Yellow Medium and Cadmium Yellow Medium + Hansa Lemon Yellow. 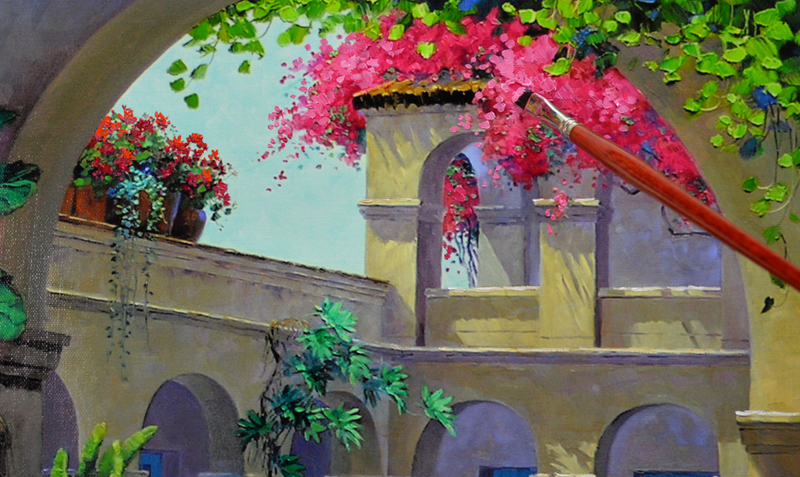 The room where the piece will hang has accents of Rust, so I add some Rusty Red-Oranges into the blossoms in shadow. 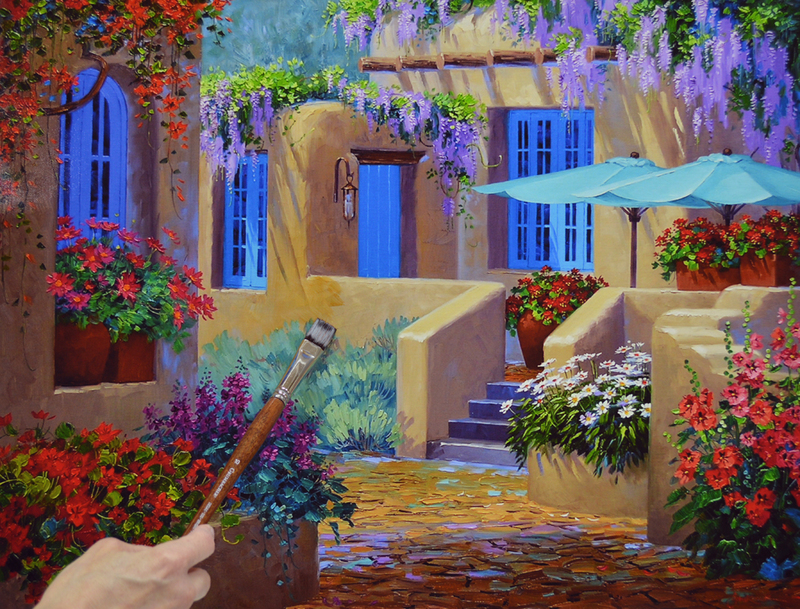 Before we get started I want to let you know Jack’s latest article has hit the internet on Fine Art Studio Online. CLICK HERE to read Those Who Know. 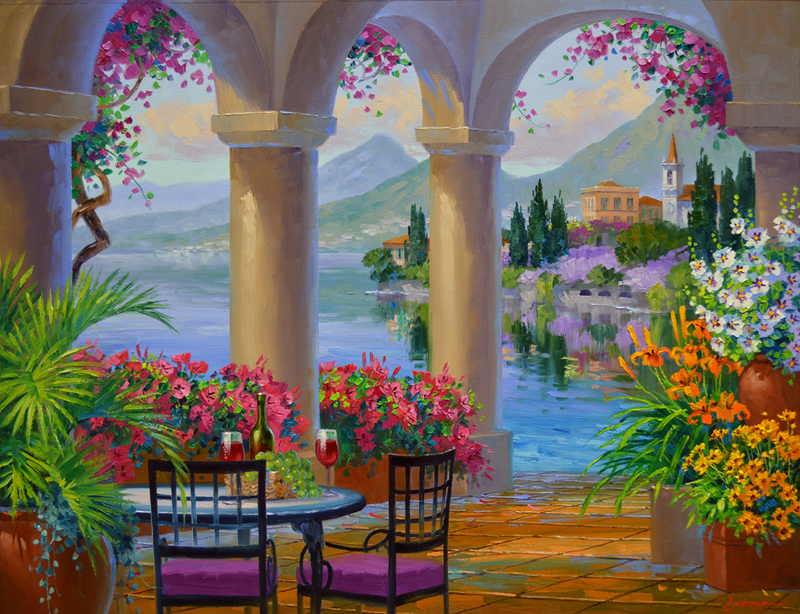 Our Limited Original Giclees on canvas are high quality digital reproductions of my oil paintings. Even though each one is part of a numbered edition, I go back in and do a lot of hand embellishing. Therefore every giclee in the edition is different, or an original. That’s how Jack came up with the name, Limited Original. 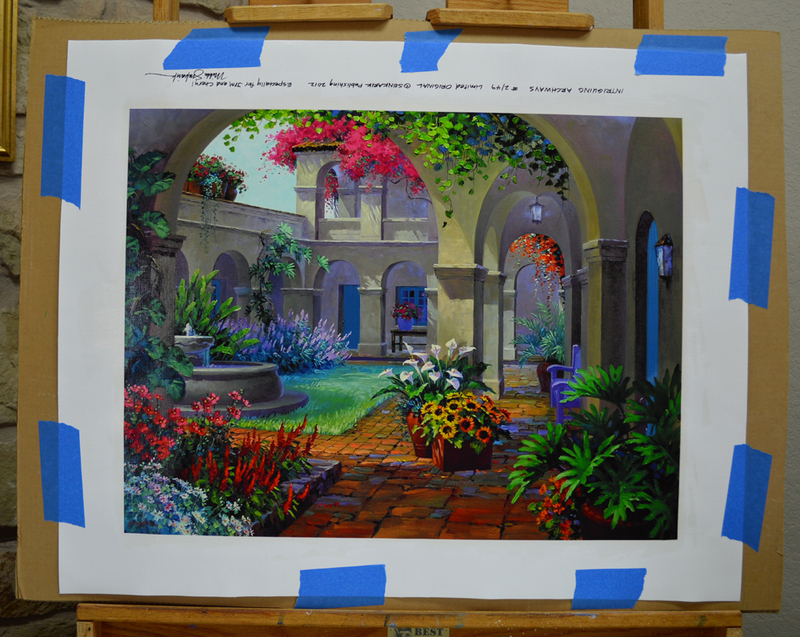 The giclee is taped to double ply cardboard and two thin coats of UV Varnish are applied with a foam brush. After that dries for a day we are ready to begin painting. 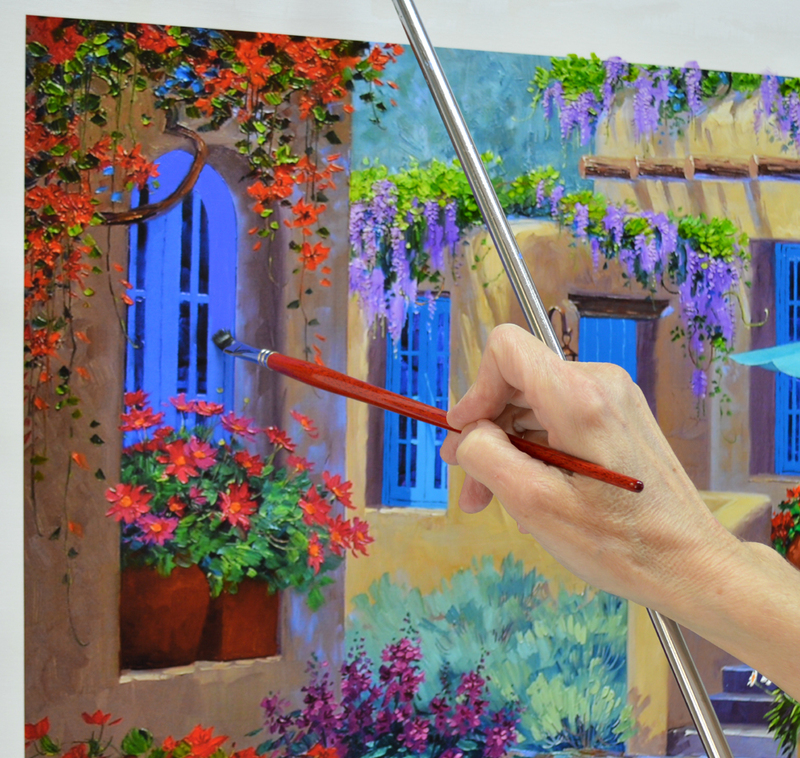 Alkyd Oil Paints are used for enhancing the giclee on canvas because they dry so much faster than our regular Oil Paint. The thickest brushstrokes will be totally dry in a day or two. I use the same colors that are on our regular palette. To learn more about our color mixing system CLICK HERE. Our collector wanted to replace the red barn in this piece with one from The Glory Never Fades, a commission I painted a few years ago. 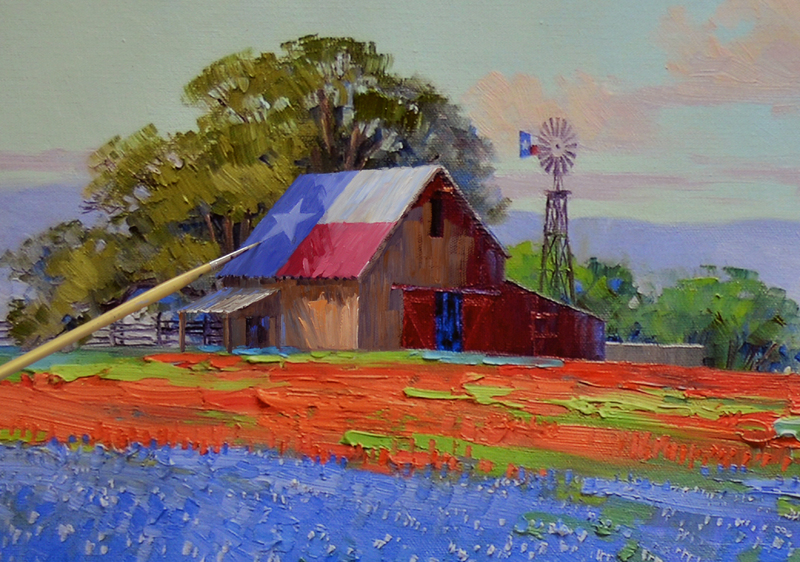 She really liked the Texas Flag on the roof and weathered wood structure in that painting. I decided to attach a small lean-to on the side of the barn for added interest. Jack and I agree with Sheree, we love the barns you see in Texas with our Lone Star painted on the roof. This is always fun to do, the Ultramarine Blue used for the blue field of the flag is dulled down with touch of MUD (Ultramarine Blue + Alizarin Crimson) + White. The star is in the shadow cast by the large live oak so a little of the blue from the roof is added to the White to darken it. We’ve had several requests for me to post more paintings on eBay and I’ve been trying to find the time to do just that. But our galleries have sold several pieces recently. 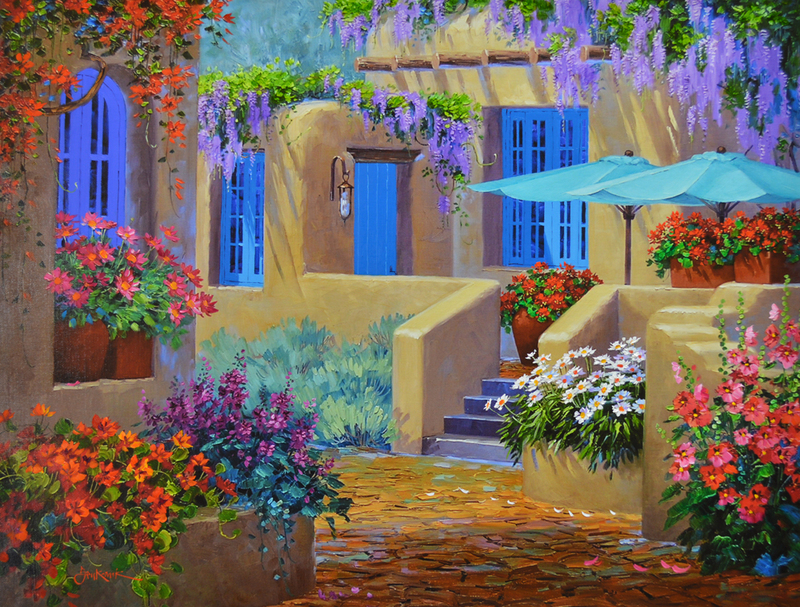 Santa Fe has empty walls from our successful collector event and I still have commissions to do, one is 60 inches by 60 inches. So I don’t know how much I’ll get to list on eBay in the next few months. However, with all that said I have a special painting just for our eBay collectors! CLICK HERE to go directly to my auction of A Stunning Spring. 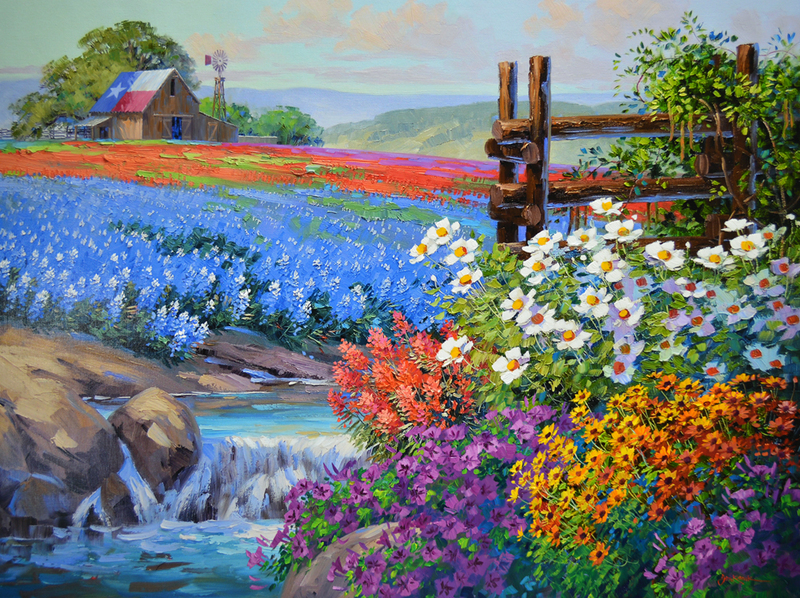 If you’ve never seen Texas in the spring you have certainly missed a beautiful sight. The landscape looks as if God has splashed buckets of paint in all shades of the rainbow across the hills. The intensity of color is amazing. And the Bluebonnet is in its glory. Fields appear to be covered in blankets of blue. 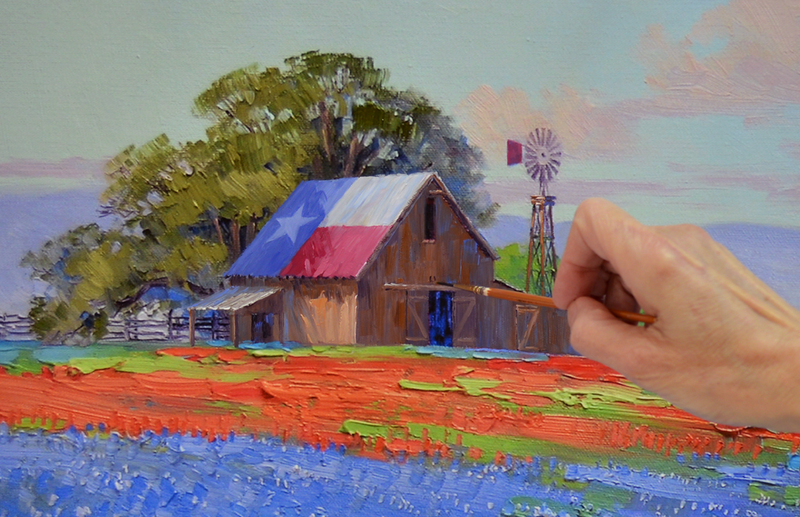 Many of the artists who follow my blog have asked how I paint our state flower. 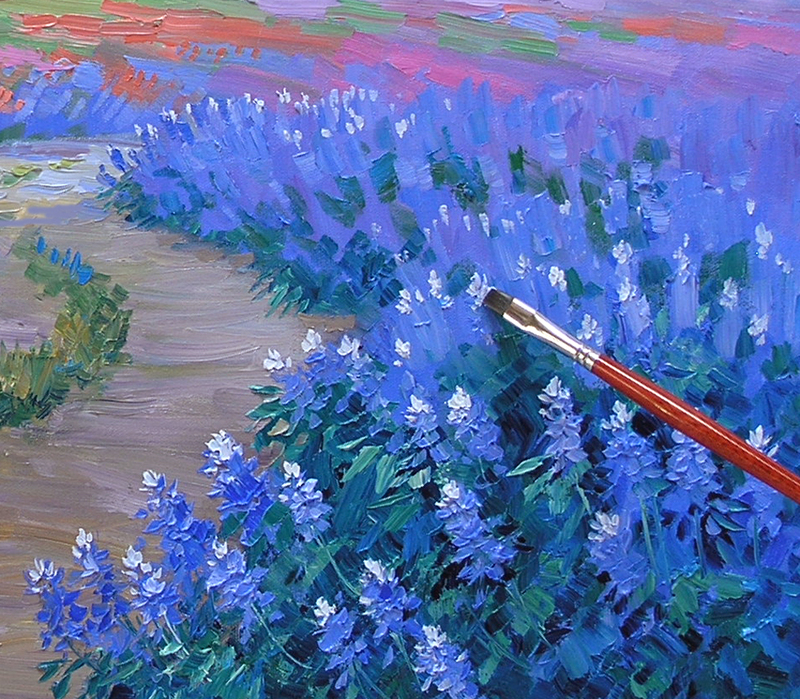 So today I will narrow the focus of our step-by-step and concentrate on the Bluebonnets. 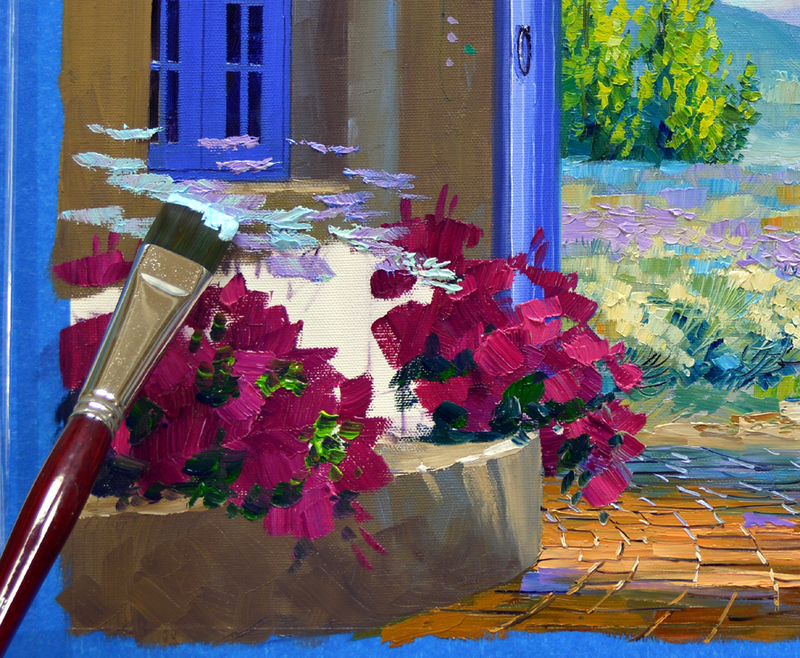 Cobalt Blue + White is the base color used to block in the flowers. 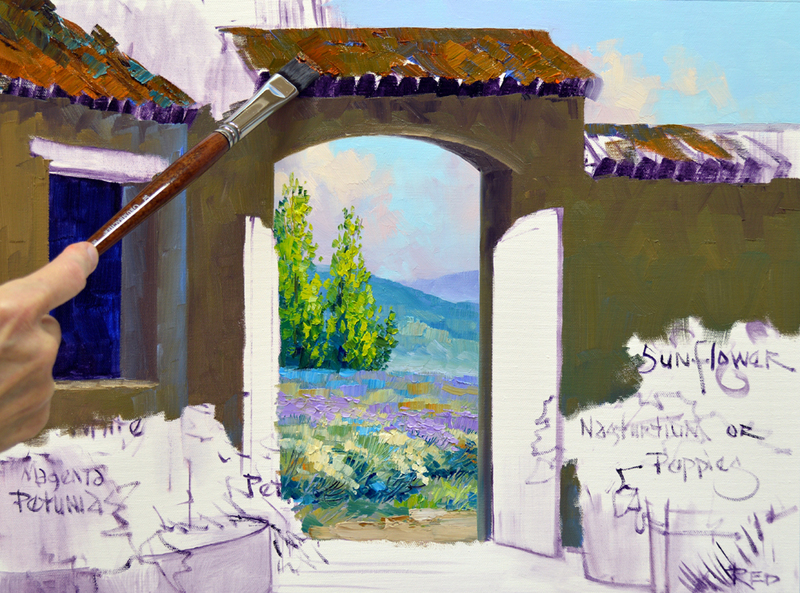 A touch of Ultramarine Blue is added to the mix making a duller blue to use for the flowers toward the back of the field. The gentle S curve of the road is now painted. The foreground is in shadow while a hint of sunlight illuminates the road as it disappears around the bend. The foliage is painted around the blue of the flowers. 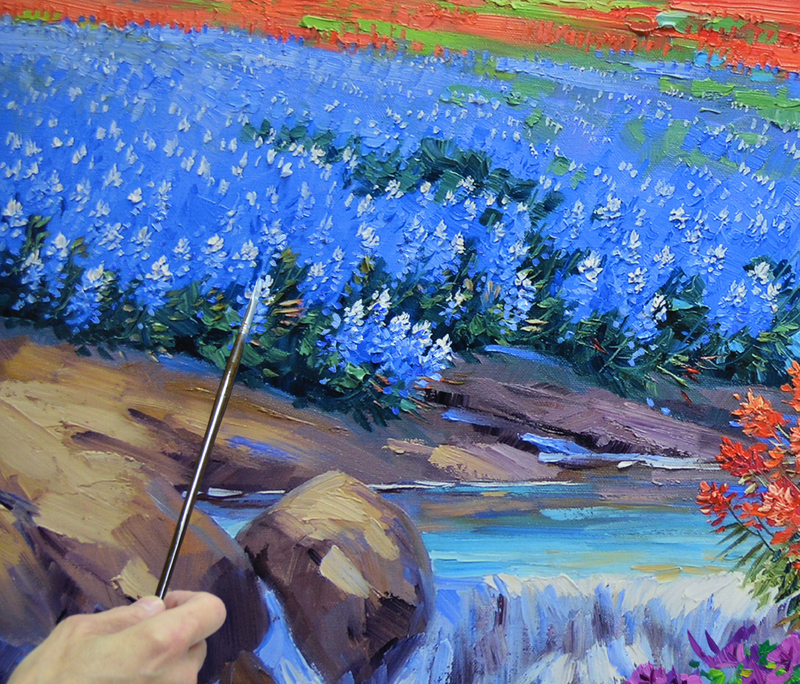 Various mixtures of Pthalo Blue + Cadmium Orange + White are used for the leaves of the Bluebonnets. Details of the blue blossoms, stems and leaves are added. 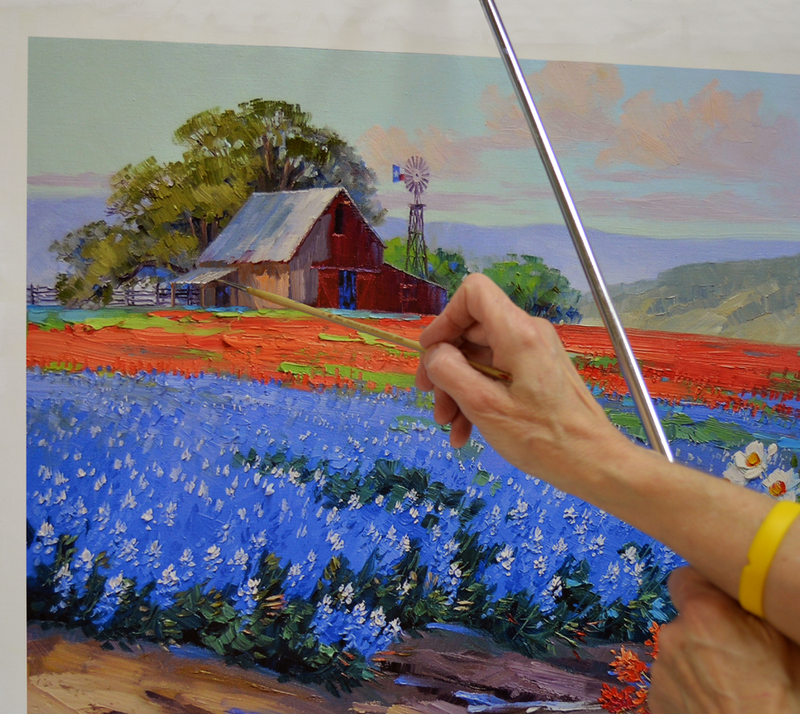 The final step of painting Bluebonnets is to add the white petals that top the blossoms like tiny white caps. As the flowers recede into the distance a touch of blue is mixed into the white for the tops so they will fall back. To see any of these pictures larger just click on the image. On this crisp spring morning you can see the mist rising from a stream at the base of the hill in the distance. 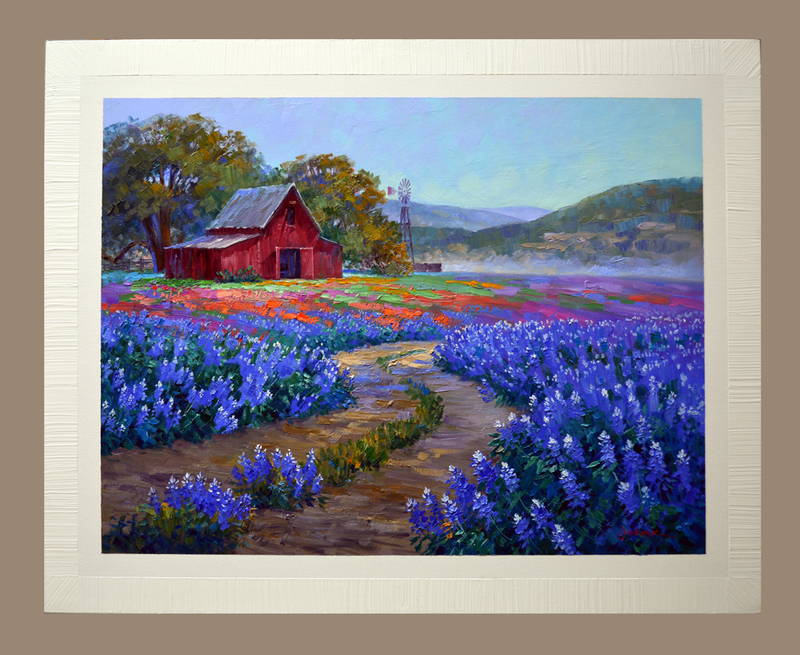 The addition of an old red barn and a windmill in the field of wildflowers makes for A Stunning Spring to enjoy all year ’round hanging on your wall. A Stunning Spring is quite a bit larger than I normally paint for eBay but you’ve requested some bigger pieces. I try to do as I’m asked! 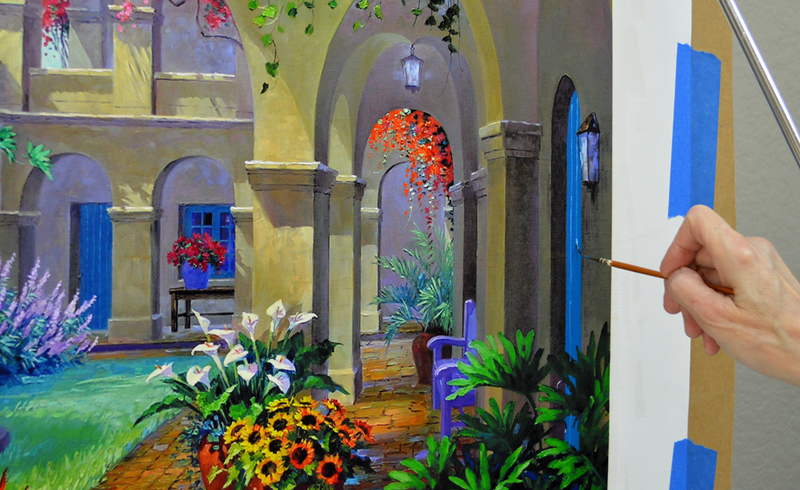 The painted image is 19 inches tall by 25 inches wide. The outside dimension of the frame is 24 inches tall by 30 inches wide. 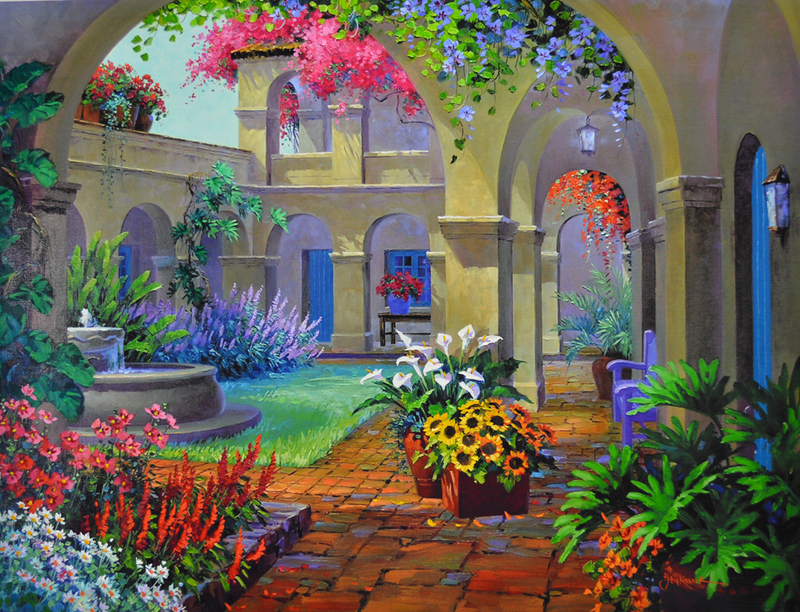 A Senkarik Original Oil Painting this size retails in our galleries for $1,900. The painting is wired, ready to hang, and the hanger with a nail is included. Bidding for this piece starts at 1 cent. That’s right, A PENNY! To go to my eBay auction CLICK HERE. Pink Petunias offer a nice contrast to the water behind them. 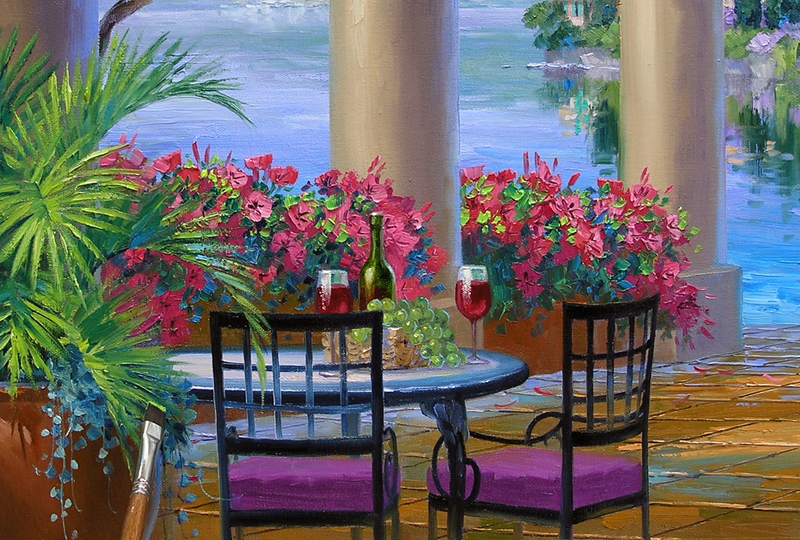 As I block in the flowers with shades of Permanent Rose + White and Permanent Rose + Magenta + White I make sure to leave the area around the wine glasses uncovered. 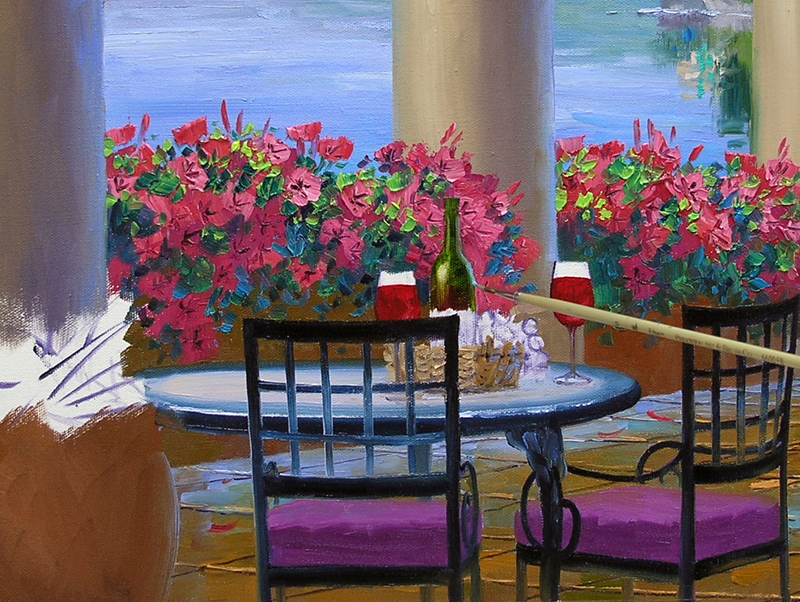 Leaves are now worked around the blossoms and wine glasses. Green is the complimentary color, or across the color wheel, from the red of the wine. Placing them next to each other makes the red appear more intense. 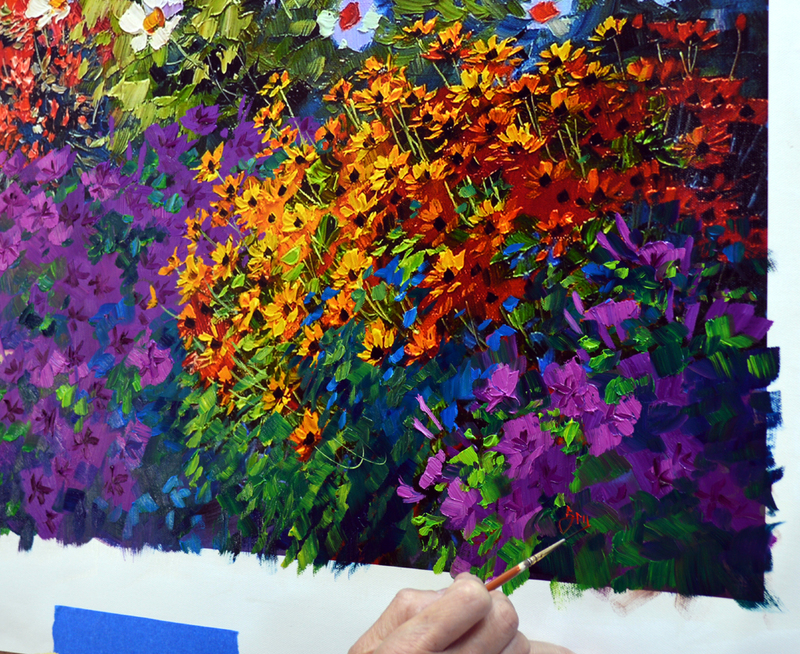 The deep centers of the Petunias are added with Magenta. 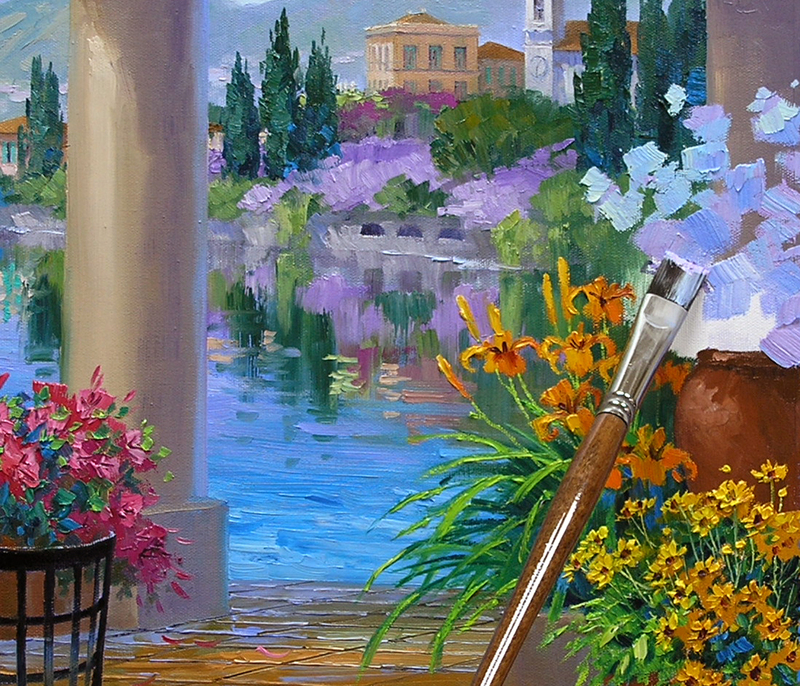 I let the Petunias drape down behind the wine bottle so it doesn’t get lost in the leaves. The shadow, or right, side of the bottle is rimmed with blue to help “Round” the bottle. After the glasses and basket of grapes are complete I paint the lacy fronds of the palms in the foreground container. Mixes of Ultramarine Blue + Hansa Lemon Yellow are used for the warm greens. 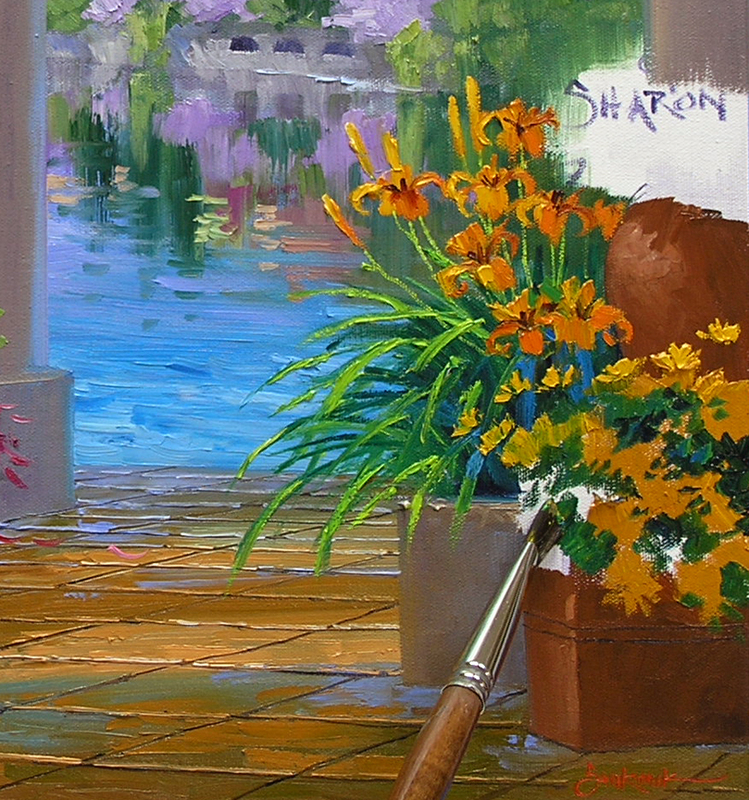 Daylilies are some of the few flowers I don’t paint in my usual sequence of Flowers First, Leaves Last. 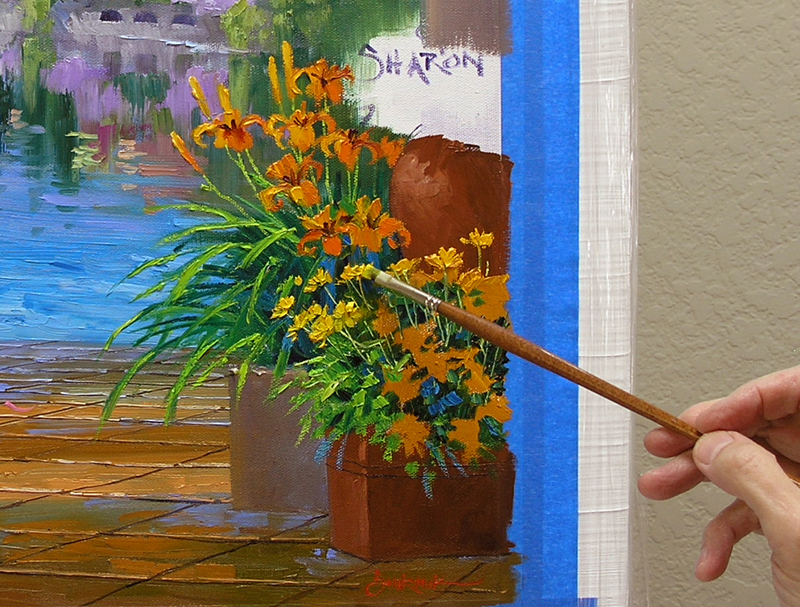 It’s much, much easier to paint the strap-like leaves first than trying to work them around the Daylilies. Then I gently “Lay” the color of the flowers on top of the green. 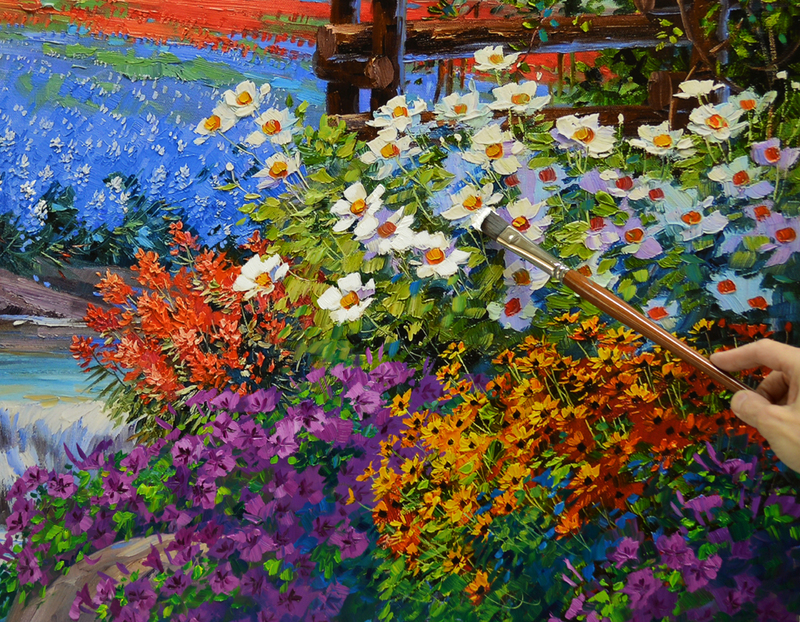 I’m careful not to let my brush pick up any of the underlying leaf color which would muddy the blossoms. 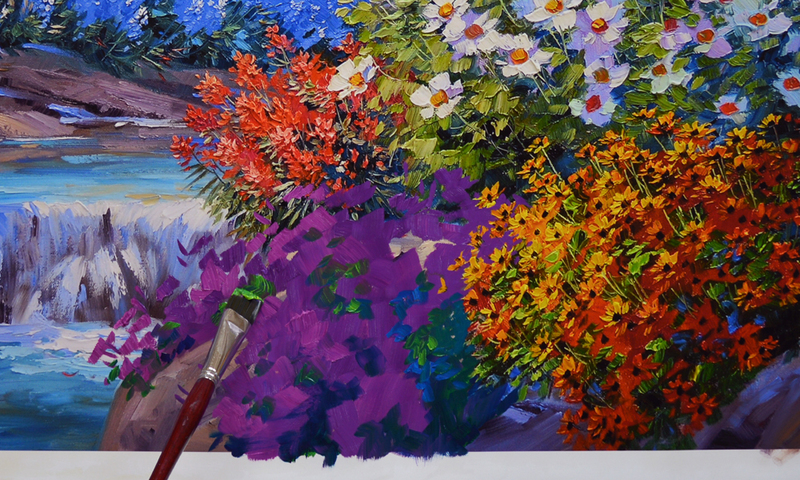 Going back to my normal order the flowers of the Coreopsis are painted first. 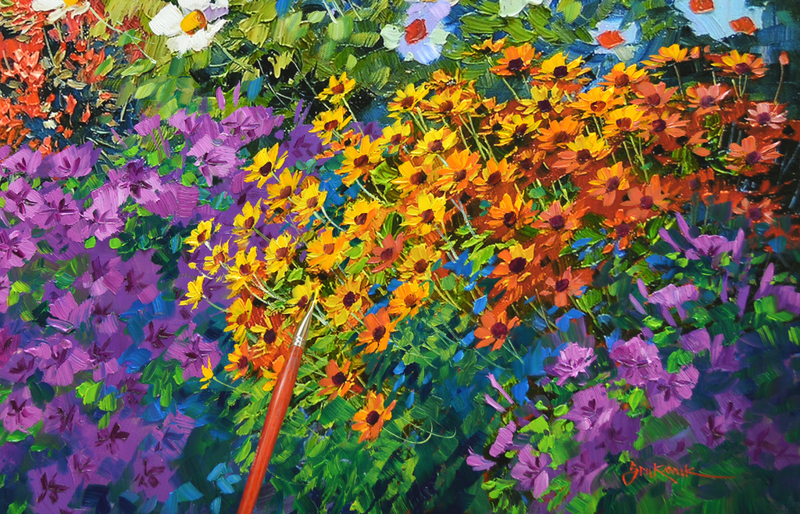 The daisy like blossoms are made with mixes of Cadmium Yellow Medium + Cadmium Orange and pure Cadmium Yellow Medium. 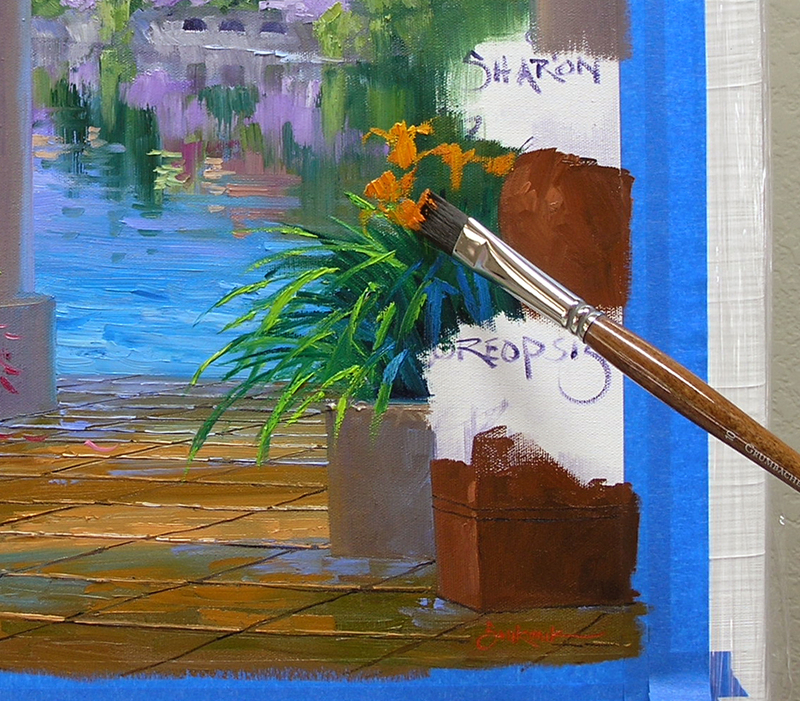 For the leaves here I use the same greens of Pthalo Blue + Hansa Lemon Yellow that were used for the Daylily foliage. Highlights of Hansa Lemon Yellow accentuate the petals of the Coreopsis. The flowers of the white Rose of Sharon are blocked in with several shades of blue and lavender. This color mass will serve as the shadows of the white blossoms.